The Cocker Spaniel gets its name from its ancestoral history of hunting woodcock in England! The Cocker Spaniel is a sporting breed skilled at hunting waterfowl and upland game birds. 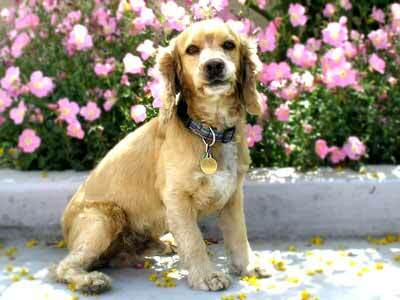 The breed known as the Cocker Spaniel in the United States, is known elsewhere as the American Cocker Spaniel. It is a variation of the English Cocker Spaniel, which has separate stud books and standards. It is still a popular sporting dog today, but with its sweet and gentle nature it is more more often found as a pet. Its pleasing temperament along with its stunning looks have also led to its immense popularity as a show dog. Cocker Spaniels are cheerful, sociable dogs. They are playful and active, yet gentle. For the most part they get along well with children and other pets.It is important to obtain them from reputable breeders as improper breeding increases the likelihood of behavioral problems.,They are very devoted to their families and makes an excellent companion dog. They also do well in conformation shows, agility, and tracking. When selecting a Cocker Spaniel, it is important to check bloodlines for hereditary problems. Careless breeding has led to a number of health issues in the breed, including eye and ear problems, anemia, and joint problems. Breed Type The Cocker Spaniel is a sporting breed. Traditionally used to flush out birds and other prey, the Cocker is now a popular pet. Background The breed known as the Cocker Spaniel in the United States is known elsewhere as the American Cocker Spaniel. It is a variation of the English Cocker Spaniel, which has separate stud books and standards. The Cocker Spaniel gets its name from the older variety's history of hunting woodcock in England. It is also skilled at hunting waterfowl and upland game birds. Although still a popular sporting dog, the Cocker Spaniel is more often found as a pet today. Its sweet, gentle personality and stunning looks have also led to its immense popularity as a show dog. Description The American Cocker Spaniel has a round head with a wide muzzle, long ears, and a brown or black nose. It has a beautiful silky coat with a bit of a wave to it. Colors include black, silver, buff, red, brown (sometimes with tan points), black and tan, and parti-colored. Parti-colors include black and white and brown and white, both of which may have tan points, and red and white. Blue, orange, and liver roans can also be shown, but sable and merle unacceptable according to breed standards. Female American Cocker Spaniels are about 14 �½ inches tall, and males are about 15 �½ inches tall. Both weigh 15 to 30 pounds. English Cocker Spaniels have longer muzzles than the American. They also tend to be slightly larger. Care and Feeding Cocker Spaniels need a diet that is low in carbohydrates with an average amount of fat. Good food choices include poultry, dairy, corn and wheat. If left long, the Cocker Spaniel's coat needs a substantial amount of care. Daily brushing, frequent shampooing, and quarterly clipping are musts. For pets and hunting dogs, it is usually preferable to keep the hair trimmed to reduce the amount of grooming necessary. The American Cocker Spaniel's tail is docked to 2/5 of its original length where permitted, and rear dewclaws should be removed. Both procedures are done at a few days of age. Cocker Spaniels shed moderately. If kept indoors, regular vacuuming will be necessary. Housing Your Dog Cocker Spaniels can live in small or large spaces, as long as they have at least a small yard and get enough exercise. Social Behaviors For the most part, Cocker Spaniels can get along with anyone. They do well with children, and usually have few problems with other pets. It is important to obtain a Cocker Spaniel from a reputable breeder, because improper breeding increases the likelihood of behavioral problems. Handling and Training Cocker Spaniels are generally quite easy to train. Housebreaking sometimes goes slowly, however, and excessive barking can be a problem. Activities The Cocker Spaniel is an energetic breed that needs plenty of exercise. They need long daily walks and enjoy running off-leash as much as possible. Breeding/Reproduction When selecting a mate for your Cocker Spaniel, check bloodlines for eye and ear problems, anemia, and hip dysplasia. Common Health Problems Some of the most common ailments of this breed include PRA, glaucoma, cataracts, and patellar luxation. They may also have autoimmune problems, and are somewhat prone to bloat. Availability Cocker Spaniels are quite easy to find in most areas, but it is important to find a good breeder in order to minimize the chances of serious health and behavioral problems. Prices vary significantly. My cocker spaniel tried to bite my mom, even when she was leting him for a walk, we have treated him good. The vet says that he's angry, I don't really know whats up with that dog, can someone tell me how to help my dog? how long does a dog's menstrual cycle last? and how often do they occur? My husband and I had a Cocker Spaniel and were fairly pleased with him. He was a wonderful dog, loved attention, and was cuddly. It was very tough for us to send him to a new home. He was like one of our own children.